Will has no choice, His father drags him along on a wilderness adventure in the footsteps of legendary explorers Lewis and Clark — whether he likes it or not. All the while, Will senses that something about this trip isn’t quite right. It is a journey into the soul of America’s past, and the meaning of family in the expansive present. In the end, Will must face his own, life-altering test of courage. 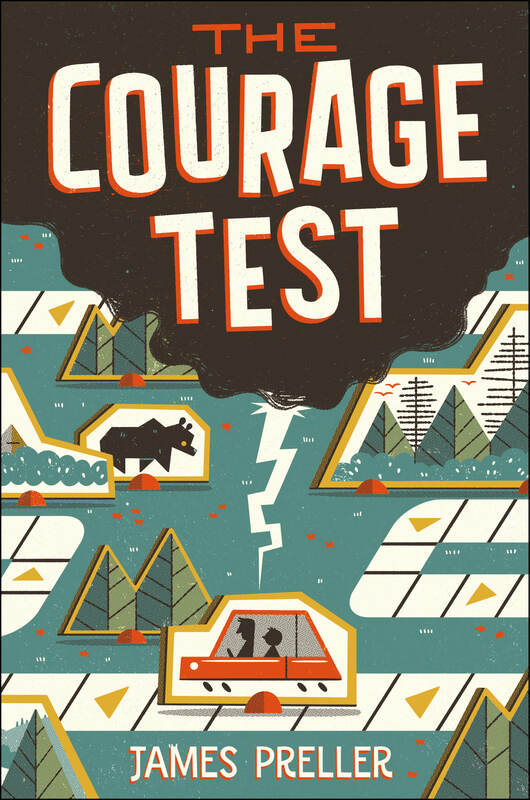 Here’s a brief excerpt from the first couple of pages from THE COURAGE TEST (Macmillan, October, 2016). The spectacular cover was illustrated by Andrew Kolb. I hope you like it. My name is William Meriwether Miller. I was named after the explorers, William Clark and Meriwether Lewis. It was my dad’s idea. So I guess this trip was inevitable, like homework and awkward school dances. He’s dragging me down the old trail. It’s the last thing in the world I want to do. My mother pushes me out the door and I don’t know why. “I don’t want to go,” I tell her. “We’ve been over this,” she says. She might as well say what every parent resorts to when they run out of good answers: Because I said so. There’s no explanation, no more discussion. It’s time for me to go. I feel ridiculously, stupidly, helplessly annoyed and there’s nothing I can do about it. I see in that instant my mother is getting old. Stray gray hairs, wrinkles around the down-turned corners of her mouth. She looks tired and thin, sick of arguing with me. I carry a fully loaded, metal-frame backpack on my shoulders, and a smaller gym bag in my right hand — stuff for the long drive, all my technology’s in there. I don’t want to go, but I can’t stand here forever. So come on, Mom, let’s do this. I give her nothing. Not a nod. I’m not even listening. I turn my back to her. I walk away like I don’t hear. I raise my hand in goodbye without looking back. My father waits in the car. He steps out as I approach. I nod to him, hey. None of this is my idea. I have no say, no choice. I refuse to be happy about it. I’m not going to make this easy. “Here, um, let me help you with that,” he reaches to take my backpack. “No, I got it,” I say, leaning away. “Oh, okay, sure,” he says. He stands there, not knowing what to do. “Are you going to pop the trunk?” I ask. Because: obviously. Flustered, my father moves to the driver’s side door. He fumbles in the front pocket of his water-resistant khakis, drops the keys on the road, stoops to the ground. I glance sideways, slyly, to check how this is playing from the front window. But my mother is no longer watching. “Ready?” my father asks. His body is half-turned in inquiry, one hand on the steering wheel, the right gripping the ignition key. A question with no true answer. I don’t have a choice. So, sure, Dad, I shrug, I’m ready. But the truth is I’m not. He knows it, too, yet asks anyway. And away we roll. It is awkward all around. This is the man who moved out of the old house fifteen months ago. He started a shiny new life, soon featuring a new girlfriend, while my mother and I got stuck rebuilding the old one. As the car slides forward, I spy my friend, Yoenis, on the sidewalk. Tall and dark and slender, he juggles a soccer ball on his foot, tap-tap, tap and pop, and he snatches the ball between his hands. A bright smile sunbeams across his face. He’s a guy who can do anything he wants. Yoenis glimpses me through the car window and his smile drops. He waggles a finger skyward. His head shakes. I don’t know what it means. Is he pointing to the sun, the sky? Is he gesturing to God above? Or is he just saying, no, don’t go, you’ll miss everything. I wonder if he knows something I don’t know?